Perhaps this is an opportune moment to purge something that has bugged me for months; i.e., the utter predictability of everything that has been unfolding since the coup d’etat by plebiscite some months ago. I can’t claim greater prescient imagination than so many other rational followers of progressive politics that I have observed in various internet forums; but I did venture to write about this back in the contentious weeks leading up to the 2012 (POTUS v. Romney) election and shared with my brother, with whom I frequently exchange political email rants. With profound sadness I am pulling it from my email archives and dropping it here for anyone else who may have seen all of this coming. It is what you too were thinking perhaps? The subsequent interloping extinction level event called “trump” was an epic failure of imagination for any sentient carbon-based life form, who was more likely to crack the mysterious mathematics of infinity than to have foreseen that cruel catalyst lurking within any cosmic quandary in the spacetime of politics. November is “game over” for Democrats and progressives if Republicans win. An objective look at the recent congressional record shows that the Republicans have yet to introduce or support any jobs initiatives beyond tax cuts and repeating stale platitudes of prosperity that has failed to trickle-down to the middle class after thirty years. Their admitted obstructionism of all legislation, designed to hurt the President, has hurt the economy, and in turn has prolonged the suffering of all those victims of the 2008 economic meltdown. 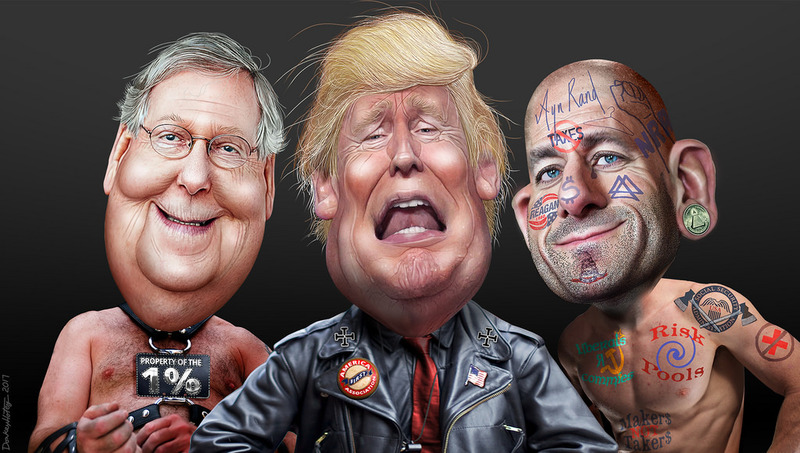 Congressional Republicans’ simple plan has been to prolong the Great Recession and inflict as much hardship upon the electorate as possible while waging a relentless media campaign to scapegoat this administration as the true perpetrator. And for all this they continue to pay no political price. They are enabled – even coddled – by a beltway media frat club constantly jockeying for favor and access while formulating clever political narratives that will impress their peers in journalism. They are further sheltered from reprisal by a right wing media bubble that repels all reality, truth, and accountability. Sadly, the bane of the many critical-thinking liberal minds – one bordering on mental disorder – is the compulsive need to find logic and order in the inverse workings within the bizarro Republican universe. However we must eventually stop ourselves and accept that all mind-bending Republican ideology and tactics are conveniently possible because there is no logic or order in their universe to constrain them. Yes, and what a perfect universe it is that they all live in; where everyone in the collective is bobbing their head in affirmation before a sentence is concluded. Where every complex issue can be explained or answered with no more words than will fit into a common fortune cookie. Where a selection of ordinary words have been individually encoded to convey large chunks of mythology. Where mythology is rendered immutable by simple inoculations against “lamestream media” rebuttals or confounding factual data from certified public sources. Please consider that people in the “home-bound” GOP base have no experience with other countries or cultures. They also have little, if any, experience with an entire range of concepts. They rely on second hand opinions that they “interpret” as factual information. They never studied or read about communism, socialism, fascism, history, science, cultures, religions, etc. So they have assimilated insufficient raw data to have developed a rich and complex map of reality necessary to comprise an informed electorate. To make things worse, they assume that everyone else comes by theirs by the same process; thus we get the dismissive projection that liberal minds only contain or process what is “told” to them. Swirling vertices of confusion and mendacity and fateful calculation are all converging into a perfect storm which the voters must navigate without benefit of clear skies or reliable compass. However, a birds-eye view from beyond low-hanging fruits of political deception reveals a clear perspective of conditions likely beyond the next election. Our future. Thirty million dollars will outpace thirty thousand “boots on the ground” wielding clipboards and knocking on doors. State elections can be bought by one billionaire donor for – relative to him – the price of a hot dog. Elections are reduced to expensive public relations campaigns that produce the required Pavlovian responses that manifest in the privacy of a voting booth. So what of our Courts? Certainly immune to politics, and the ultimate bastion of justice for the wronged individual or repressed constituencies? No, actually. Do you want to leverage control of a State Supreme Court? Buy the election for the judges of your choice. In states where they are appointed, buy the governor’s office and let him do the stacking. State house seats are a dime a dozen and the plutocracy has noticed the fire sale that commenced with Citizens United. Big business will close the circle on tort reform and deregulation; stifling all litigation and rules that have hampered their progress for decades. Citizens will find no quarter and certainly no venue that adjudicates accountability or where justice may serve to protect the weakest among us. In the Senate, there has been a long-standing bipartisan fear of abolishing the filibuster. It is traditionally viewed through the lens of checks and balances as the coveted weapon of last resort for either party who might find themselves in the minority. However, with unlimited money behind them virtually guaranteeing a permanent majority in the U.S. Senate, the Republicans can confidently hold a 51 seat majority in perpetuity. That old 60-vote filibuster-proof rule will be an obsolete club in their bag, so emboldened Republicans may exercise the “nuclear option” of employing procedural maneuvers to kill it off. After that the Democrats in the Senate might as well stay at home and work on their Facebook and Twitter accounts. They can sublet their Senate offices to the K-Street lobbyists who will appreciate being on premises to write all of the legislation FOR the Republicans. In 2005, MBNA suffered the inconvenience of commuting to and from Capitol Hill while authoring the biggest rewrite of U.S. bankruptcy law in a quarter century, to protect the banking industry and themselves from the phantom scourge of “consumer fraud” that was sapping their astronomical profits. Next comes the tsunami of unfettered legislation on social and fiscal policies. Roe v. Wade — gone! Eminent Domain — ceded to any monied interest. Privatization of schools, police, fire, prisons — done! Social safety nets — eviscerated or privatized. Draconian voter suppression legislation — boom! Environmental safeguards and regulations – outta here! Food, water, medicine — as long as it all goes in as presented and comes out as visibly unalarming and flush-able content for a toilet bowl, then everything will be fine regardless of whatever else is in them.